What is driving the new wave of anti-Semitic threats. Paula Simons: Too easy to blame new wave of anti-Semitic threats on Donald Trump. Shimon Peres (1923-2016) passes away September 27, 2016. World leaders praise the last of Israel’s elder statesmen. “Shimon Peres was, above all, a man of peace and a man dedicated to the well-being of the Jewish people. There are few people who we share this world with who change the course of human history, not just through their role in human events, but because they expand our moral imagination and force us to expect more of ourselves. My friend Shimon was one of those people. Shimon Peres once said that, “I learned that public service is a privilege that must be based on moral foundations.” Tonight, Michelle and I join people across Israel, the United States and around the world in honoring the extraordinary life of our dear friend Shimon Peres—a Founding Father of the State of Israel and a statesman whose commitment to Israel’s security and pursuit of peace was rooted in his own unshakeable moral foundation and unflagging optimism. I will always be grateful that I was able to call Shimon my friend. I first visited him in Jerusalem when I was a senator, and when I asked for his advice, he told me that while people often say that the future belongs to the young, it’s the present that really belongs to the young. “Leave the future to me,” he said, “I have time.” And he was right. 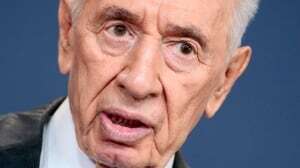 Whether it was during our conversations in the Oval Office, walking together through Yad Vashem, or when I presented him with America’s highest civilian honor, the Medal of Freedom, Shimon always looked to the future. He was guided by a vision of the human dignity and progress that he knew people of goodwill could advance together. He brought young people from around the world together because he knew they could carry us closer to our ideals of justice and equality. Shimon was the essence of Israel itself—the courage of Israel’s fight for independence, the optimism he shared with his wife Sonya as they helped make the desert bloom, and the perseverance that led him to serve his nation in virtually every position in government across the entire life of the State of Israel. As Americans, we are in his debt because, having worked with every U.S. president since John F. Kennedy, no one did more over so many years as Shimon Peres to build the alliance between our two countries—an unbreakable alliance that today is closer and stronger than it has ever been. Perhaps because he had seen Israel surmount overwhelming odds, Shimon never gave up on the possibility of peace between Israelis, Palestinians and Israel’s neighbors—not even after the heartbreak of the night in Tel Aviv that took Yitzhak Rabin. “Dear friends,” he told us during my visit to Israel three years ago, “after everything I have seen in my life, I earned the right to believe that peace is attainable.” Tonight, I can think of no greater tribute to his life than to renew our commitment to the peace that we know is possible. Our thoughts are with his children Zvia, Yoni and Chemi, their families and all who loved and admired Shimon Peres, of blessed memory. A light has gone out, but the hope he gave us will burn forever. Shimon Peres was a soldier for Israel, for the Jewish people, for justice, for peace, and for the belief that we can be true to our best selves – to the very end of our time on Earth, and in the legacy that we leave to others. For the gift of his friendship and the example of his leadership, todah rabah, Shimon. Laureen and I were saddened today to learn of the passing of President Shimon Peres, a towering figure in the history of the State of Israel and one of the great statesmen of our age. Shimon Peres’ long and distinguished political career was animated by a tireless spirit of patriotism, faith, and public service. His was a life of sacrifice not only for his country and its citizens, but the very idea of Israel — the dream of a safe and prosperous Jewish state able to live in confident peace with its neighbours. Defeat and setback never deterred him, and his quiet humility and perseverance made him a model of dignity and an inspiration to the world. As a man who served his government in so many different capacities over so many decades, he demonstrated it was indeed possible to transcend the myopic world of politics in the pursuit of permanent ideals. I was honoured to meet Shimon Peres several times during the course of my own public life, and was consistently moved by his depth of knowledge and strength of character. It seemed remarkably appropriate that he was asked to spend his final years holding Israel’s highest office, a position perfectly suited for a man who had come to so thoroughly embody the spirit, values, and virtues of the remarkable nation to which he devoted his life. ISIS burns church and kills Christian children. Post by The Israel Project. The massacre may have ended, but the cries still reverberate; Jews the world over can hear it, but they are not silent. Waving placards and appealing to all levels of government to condemn those in Canada who support terrorist activities, demonstrators at a memorial vigil and protest organized by the Jewish Defence League of Canada also called for the closing of the Palestinian House Educational and Cultural Centre. Calgary B’nai Brith Lodge mourns the passing of past president, Aron Eichler, z”l. Aron was very active in the Calgary Jewish community for many years as an educator, professional and volunteer. The lodge extends its deepest sympathy to his children and grandchildren. May his memory be for a blessing. OTTAWA, February 11, 2014 — B’nai Brith Canada, the country’s senior Jewish human rights organization, has applauded the Harper Government’s continued resolve to confront terrorism and its supporters as reflected in the budget handed down today. Frank Dimant, CEO of B’nai Brith Canada who personally congratulated the Prime Minister on the budget and was present in the House of Commons at the time of the announcement, remarked, “The Government has once again signaled that the security of Canadians is a top priority. The measures introduced in today’s budget are designed to prevent terrorist and organized crime groups from abusing charities and the financial network to launder money. B’nai Brith Canada has been active in Canada since 1875 as the Jewish community’s foremost human rights agency.